On Friday in Hamburg, Germany, President Trump and Russian president Vladimir Putin will sit down for an official bilateral meeting that will be highly scrutinized by citizens and leaders from around the world. Last week, when the meeting was first announced, it was reportedly going to occur on the sidelines of this week’s G20 Summit. But those plans have changed, in part, the New York Times reports, because the White House feared Trump would get steamrolled by Putin in the informal setting. “Mr. Trump’s aides are seeking structure and predictability. They hope that a formal meeting, with aides present and an agenda, will leave less room for improvisation,” the Times reports. For example, the paper notes, Putin once brought a black Lab to a meeting with Germany’s chancellor Angela Merkel, who’s afraid of dogs. So what will they talk about? Fighting ISIS in Syria, Ukraine and Russia’s ongoing support for Syrian dictator Bashar al-Assad. In order to make sure Trump is prepared, his aides have added a personalized touch to the thick binder of information meant to ready him for the meeting. Aides “have written a list of tweet-length sentences that summarize the main points Trump could bring up with Putin,” the L.A. Times reports. That stands in stark contrast to Putin himself, who is known to study hard for this type of meeting and arrive with “a strategy to extract concessions,” one official told the L.A. Times. 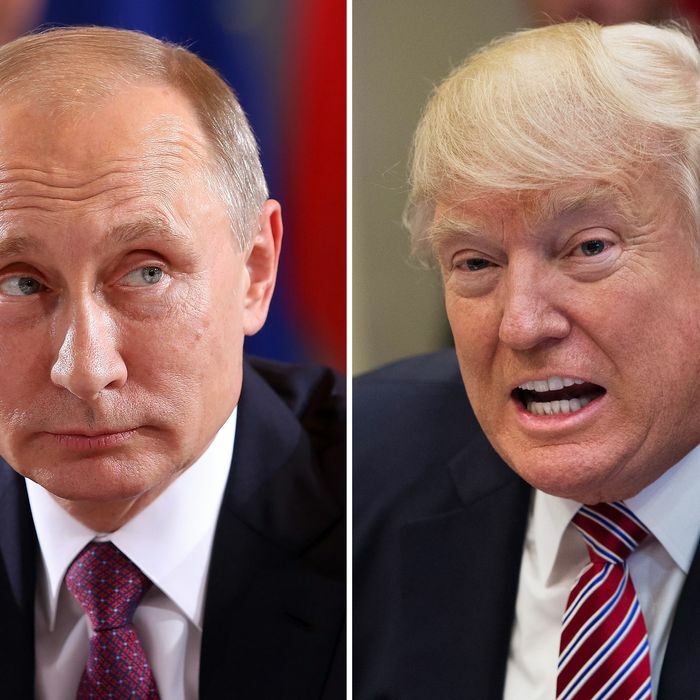 “Putin was and is a KGB officer, and KGB officers are specialists at one thing: seduction, how to persuade others to do what you want,” John Herbst, former U.S. ambassador to Ukraine, told the paper. But it’s not so much the topics Trump will discuss Friday that he’s preparing for, as much as it is the man he’ll be discussing them with. The president has been provided with a psychological profile of Putin, a wily KGB veteran with years of experience meeting foreign leaders. One fear from within the White House, the Times says, is that Trump will cozy up to Putin while “trying to forge a rapport.” With ongoing congressional and special counsel investigations into Russia’s election meddling, images of the two men sharing a loving embrace would hardly be welcome by the White House.